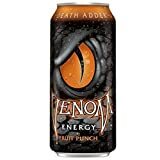 Venom Energy Drink Death Adder is a fruit punch flavored energy beverge made by the Dr. Pepper/7-Up company. Consumer Reports recently tested Venom Energy Drink and they found it to have 220mg of caffeine per bottle. This is significantly higher than what was published by Venom during the time of our review. Well, well, back for more are you? Looking to expand your knowledge about another select energy drink, are you? Well I just so happened to have a review for you right here of Venom Death Adder and it's one I suggest you follow up on! So stick around and don't touch that dial. Actually, the only thing you should be touching is a scroll wheel to read this review, which is probably the closest approximation you have to a dial at your computer. Somebody please slap me for drifting this far off topic. Have you ever consumed a drink so tasty that at first experience, it's enough to be crowned as the high point of your day? I'm talking about something that puts that pleasurable smile on your face that every Coke commercial promises, but never delivers on. Say hello to Venom Death Adder, a former champion in a day of Dusty Smith. No other energy drink has so squarely nailed the fruit punch taste as this one, in my opinion of course. It's more of a carbonated fruit-y punch. I've added that extra 'y' because there's a little something extra that adds much needed character to the standard fruit punch taste. My taste buds can't discern what else is going on. Look, if you don't like the taste of this drink you may want to get yourself checked, because you might not be human. Unknown to your gustatory senses, downing this drink will introduce your body to a combined 400% of your B vitamin daily value, 200mg of ginseng, guarana, and 160mg of caffeine. At best, it could be called above average. If Dr. Pepper/Seven Up Inc. had the guts to up the caffeine content, we'd be looking at a serious contender for best all around energy drink. Unfortunately, like everyone else, it seems they assumed that most consumers can't handle anything near 200mg of caffeine. Considering the type of people that are buying energy drinks in the first place, I have a disagreement with this, but that's getting off topic... again. Where's that slap I asked for? You owe it to yourself as a pleasure-seeking human being to track this drink down and buy it. If seeking pleasure is not your thing, I understand that running into walls is kind of painful, maybe it'll work for you. CARBONATED WATER, SUGAR, GLUCOSE, CITRIC ACID, MALTODEXTRIN, TAURINE, SODIUM CITRATE, GLUCURONOLACTONE, L-CARNITINE, INOSITOL, CAFFEINE, SODIUM BENZOATE (PRESERVATIVE), POTASSIUM SORBATE (PRESERVATIVE), RED 40, NIACINAMIDE (VITAMIN B3), NATURAL FLAVOR, GUARANA, SUCRALOSE, GINSENG EXTRACT, PYRIDOXINE HYDROCHLORIDE (VITAMIN B6), RIBOFLAVIN (VITAMIN B2), CYANOCOBALAMIN (VITAMIN B12). Sugar content: 56 grams (per 16 ounces). Venom Death Adder contains 10.00 mgs of caffeine per fluid ounce (33.81mg/100 ml).